The Suncast "Stratton" arbour will complement any backyard or setting. No cutting necessary as all pieces are pre-cut and pre-drilled for easy assembly. The arbour is constructed from natural, sustainable cedar and is unfinished, ready to stain or paint to suit your taste. Turn your yard into a canvas. This eye-catching arbour enhances the beauty of your garden while giving climbing vines and plants the freedom to grow. 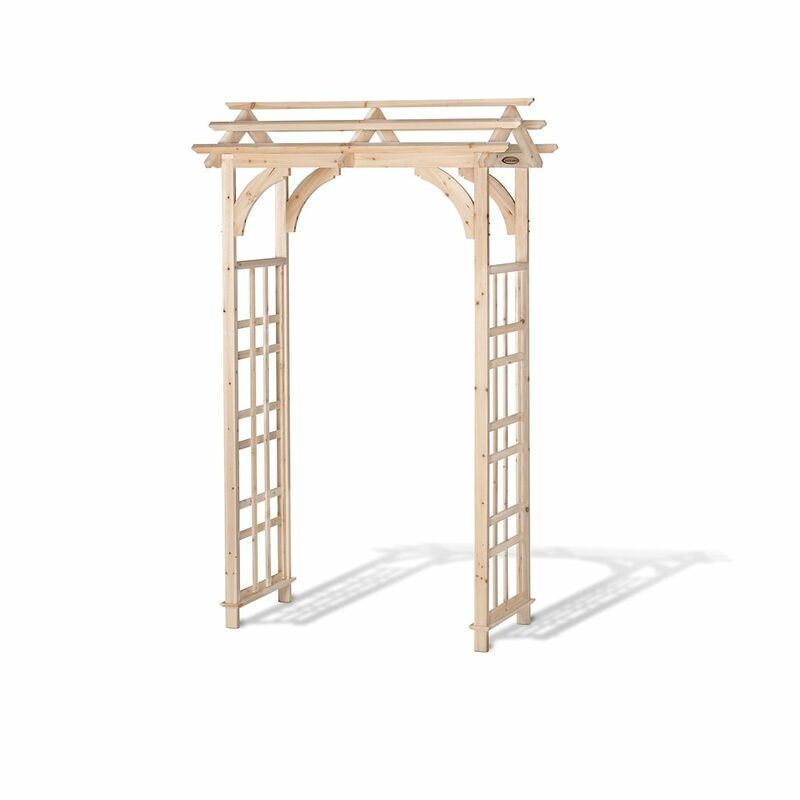 Double lattice panels make this arbour ideal for accenting a walkway or small path. Crafted of solid wood harvested from the Cypress tree family with decay resistance similar to Western Red Cedar. Moisture resistant for maximum weather protection sustains beauty and performance. Easy-to-follow assembly instructions inside package. The Fairfield Arbour with gate and wings provides the perfect structure for any yard, garden or pathway. This flat top pergola-style design is very stylish, while still offering timeless appeal, and is made with premium weather-resistant vinyl that is virtually maintenance free. The Fairfield Arbor provides the perfect structure for any yard, garden or pathway. This flat top pergola style design is very stylish, while still offering timeless appeal. Made with premium weather-resistant vinyl, this arbour is virtually maintenance free. Never stain, paint, or maintain your arbour again. Vinyl offers the classic look of wood without the headaches. Just the occasional rinse with a garden hose is all you need to do to keep your arbour looking great year after year. Stratton Cedar Arbour The Suncast "Stratton" arbour will complement any backyard or setting. No cutting necessary as all pieces are pre-cut and pre-drilled for easy assembly. The arbour is constructed from natural, sustainable cedar and is unfinished, ready to stain or paint to suit your taste. Stratton Cedar Arbour is rated 4.5 out of 5 by 2. Rated 4 out of 5 by Tirador from Just what we wanted Everything was in the box. This arbor was a good size and weight. Some of the fasteners are flimsy and I used my own so it was no big deal. Had it shipped to a local store and picked it up in under a week. Good value for the price. I did have to dig foundation holes for each leg and used 2X4s in quick set concrete to level it. Came out great after staining and sealing. Rated 5 out of 5 by Brian from Great product and even better service We used this Arbor for a wedding. Easy to build and transport. Looks great and we are glad we can now add it to our back yard. Home Depot was able to deliver this arbor to our local store within 3 days. We tried to order a similar arbor from competitors, but they failed to tell us they would not have their products in stock. Home Depot got us this arbor within 3 days. I will never shop anywhere else!